Silverstack Lab can provide transcoded clips as well as metadata from its library in a compatible format for the COPRA Dailies System. In Silverstack Lab you can export an XML file that accompanies the transcoded clips from Silverstack Lab and provides extended metadata. The proxy clips can then be uploaded together with the XML to the COPRA platform where the additional metadata is then visible. The metadata export option allows to automatically create a companion metadata file when a selected transcoding configuration is used for transcoding clips. You can learn more about Transcoding in Silverstack Lab in the equally titled article. 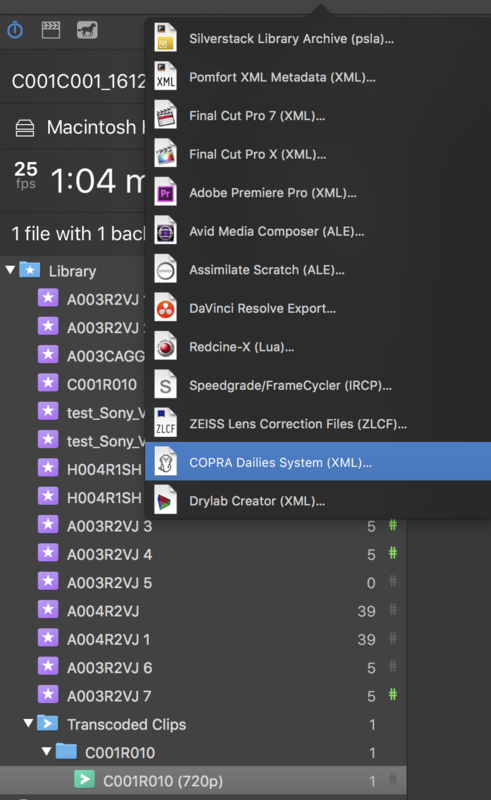 To set the COPRA Dailies System as target application for the automatic metadata export, first go to the transcoding configurations tab of the right sidebar. Select the transcoding configuration from the list that you would like the export to happen for. Scroll down to the “Metadata Export” section. Select “COPRA Dailies System” and press the “Configure…” button to select its content. When now transcoding to the adapted configuration you selected the metadata export for, the COPRA XML is automatically exported to the same folder as the clips after the job finishes and the transcoded clips are automatically ingested into the “Transcoded Clips” folder of the library. The wizard leads you through the source selection (to select the clips that should be part of the XML) and the content selection (which metadata should be part of the XML). Click the “Save COPRA XML..” button to export the xml to the intended directory.